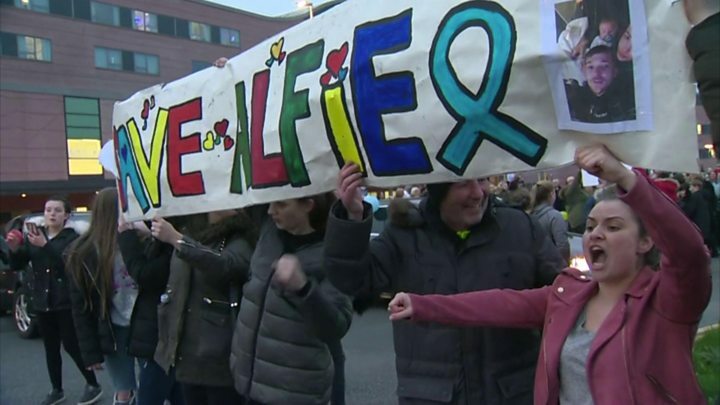 Hundreds of people have staged a protest outside a hospital in Merseyside where a terminally ill toddler is being cared for. A date to switch off the life support for Alfie Evans has been set by a High Court judge following a legal battle. Alfie's parents' legal fight against the decision ultimately ended in March when the European Court of Human Rights rejected their case. Merseyside Police had asked protesters at Alder Hey to be respectful. Officers said the "large" and "peaceful" protest in Liverpool on Thursday night "did cause significant traffic disruption and inconvenience for other people trying to access the hospital". His parents Tom Evans and Kate James, who are both in their 20s and from Liverpool, have lost cases in the High Court, Court of Appeal, and had their case rejected by the Supreme Court and European Court of Human Rights. The family told the BBC they had a private ambulance and jet on stand-by. Alder Hey say they will not allow that to happen but speaking on Thursday evening Mr Evans said they were confident they would succeed. He said: "There's no court order to say Alfie has to stay in this hospital right now. "The truth behind the matter is that me and Kate hold full responsibility and we can take him to our transportation van with full equipment with the doctors who have got full duty of care… and they are not allowing us so we are hoping that my solicitor is going to spin the spoon and get us out." Alfie's parents want him to be removed from Alder Hey and taken to the Bambino Gesu hospital - which has links to the Vatican. In a tweet the hospital said the protest had caused "significant disruption". In February, Mr Justice Hayden ruled doctors at Alder Hey could stop treating Alfie against the wishes of his parents following hearings in the Family Division of the High Court in London and Liverpool. On Wednesday, the judge said what had happened to Alfie was "profoundly unfair", as the court endorsed an end-of-life care plan drawn up by specialists.